If you are looking for a smooth polled purebred Salers bull to add width, thickness and muscle shape to his progeny in combination with a great disposition, YPSILANTI may be the herdsire you're searching for. He is a black son of TORRINGTON who descends from a cow family known for productivity. 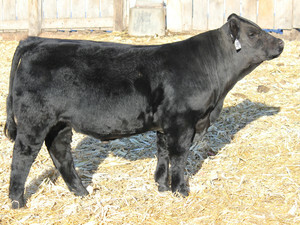 His dam has an average weaning ratio of 102 on her six calves and his grandmother was an ASA Gold Dam. Combining the strength of his cow family with the maternal traits of Milk Trait Leader TORRINGTON makes him likely to be a great female producer. YPSILANTI is a gentle but powerful bull that should widen out your calf crop and also make great females.